Authors: Zalova T.B., Polupanov A.G., Tsoy L.G., Rysmatova F.T., Sabirov I.S. Aim. To study the relationship of tumor necrosis factor α and interleukin-10 levels with the presence of left ventricular hypertrophy and myocardial remodeling in patients with arterial hypertension. Metods. 156 patients with hypertension aged 40 to 75 years (mean age 55.8±7.5 years), including 57 women and 99 men were examined. All patients were divided into two groups. Group 1 included 83 patients without left ventricular hypertrophy (55.5±7.5 years), group 2 included 73 patients with left ventricular hypertrophy (56.2±7.8 years), established by echocardiographic signs. All patients in addition to the general clinical examination and biochemical studies had echocardiography and Doppler echocardiography performed, as well as measurement of the concentration of tumor necrosis factor α and interleukin-10 by solid-phase enzyme immunoassay using specialized «Cytokine-Stimulus-Best» kit (Novosibirsk, Russia). Results. The concentration of tumor necrosis factor α in patients without left ventricular hypertrophy was 8.43±1.36 pg/ml and was comparable with the concentration of this cytokine in patients with left ventricular hypertrophy (8.54±1.58 pg/ml, p >0.05). This pattern was typical for both men and women. The concentration of interleukin-10 in both groups was also comparable (15.4±3.6 pg/ml in group 1 and 14.7±3.4 pg/ml in group 2, p >0.05). However, we identified gender-specific features in the relationship of interleukin-10 with the presence of left ventricular hypertrophy in patients with hypertension. Thus, while in women the concentration of cytokine in groups with/without left ventricular hypertrophy did not differ significantly, in men without hypertrophy the level of interleukin-10 of 15.7±3.6 pg/ml, was significantly higher than the value of the same indicator in the group of men with left ventricular hypertrophy (14.8±2.9 pg/ml, p <0.025). Multivariate regression analysis showed that tumor necrosis factor α and interleukin-10 concentrations correlated to left ventricular wall thickness in patients without left ventricular hypertrophy. No such pattern was revealed for patients with hypertrophy. Conclusion. The results demonstrate the modulating role of tumor necrosis factor α and interleukin-10 in myocardial remodeling processes in arterial hypertension. tumor necrosis factor α, interleukin-10, arterial hypertension, left ventricular remodeling. Krishnamurthy P., Rajasingh J., Lambers E. et al. IL-10 inhibits inflammation and attenuates left ventricular remodeling after myocardial infarction via activation of STAT3 and suppression of HuR. Circ. Res. 2009; 104 (2): e9–е18. doi: 10.1161/CIRCRESAHA.108.188243. Laragh G. Cardiac pathophysiology and its geterogeneity in patients with established hypertensive disease. Ibid. 1988; 84: 3–11. Ganguly P.K., Lee S.L., Beamish R.E., Dhalla N.S. Altered sympathetic system and adrenoceptors during the development of cardiac hypertrophy. Am. Heart J. 1989; 118 (3): 520–525. doi: 10.1016/0002-8703(89)90267-6. Gosse P., Campello G., Aouizerate E. et al. Left ventricular hypertrophy of the hypertensive patient: relation to exertional and ambulatory blood pressure. Arch. Mal. Coeur. Vaiss. 1986; 79 (6): 796–800. PMID: 2948469. Aksenova T.A. The immunologic disorders and dysfunction of endothelium as predictors of development of hypertrophy of left ventricle of heart in patients with hypertension disease. Klin. Lab. Diagn. 2013; (8): 18–20. PMID: 24340743. Friedewald W.T., Levy R.I., Fredrickson D.S. Estimation of the concentration of low-density lipoprotein cholesterol in plasma, without use of the preparative ultracentrifuge. Clin. Chem. 1972; 18 (6): 499–502. PMID: 4337382. Burballa C., Crespo M., Redondo-Pachón D. et al. MDRD or CKD-EPI for glomerular filtration rate estimation in living kidney donors. Nefrologia. 2018; 38 (2): 207–212. doi: 10.1016/j.nefro.2017.02.007. Devereux R.B., Reichek N. Echocardiographic determination of left ventricular mass in man. Anatomic vali­dation of the method. Circulation. 1977; 55 (4): 613–618. doi: 10.1161/01.CIR.55.4.613. Hirota H., Chen J., Betz V.A. et al. Loss of a gp130 cardiac muscle cell survival pathway is a critical event in the onset of heart failure during biomechanical stress. Cell. 1999; 97 (2): 189–198. doi: 10.1016/S0092-8674(00)80729-1. Cai J.Y., Zhai G.L., Gao W. et al. A study of the relationship between remodeling of left ventricle and endothelial injury and pro-inflammatory mediators in different stages of essential hypertension. Zhongguo Wei Zhong Bing Ji Jiu Yi Xue. 2008; 20 (12): 743–745. PMID: 19111125. Jastrzebski M., Czarnecka D., Rajzer M., Kawecka-Jaszcz K. Increased levels of inflammatory markers in hypertensives with target organ damage. Kardiol. Pol. 2006; 64 (8): 802–809. PMID: 16981055. Malavazos A.E., Corsi M.M., Ermetici F. et al. Proinflammatory cytokines and cardiac abnormalities in uncomplicated obesity: relationship with abdominal fat deposition. Nutr. Metab. Cardiovasc. Dis. 2007; 17 (4): 294–302. doi: 10.1016/j.numecd.2006.01.001. Masiha S., Sundström J., Lind L. Inflammatory markers are associated with left ventricular hypertrophy and diastolic dysfunction in a population-based sample of elderly men and women. J. Hum. Hypertens. 2013; 27 (1): 13–17. doi: 10.1038/jhh.2011.113. Leibowitz D., Planer D., Ben-Ivgi F. et al. Tumor necrosis factor and interleukin-6 levels in hypertensive patients with and without left ventricular hypertrophy. Blood Press. 2005; 14 (1): 21–24. doi: 10.1080/08037050410004792. Tilz G.P., Diez-Ruiz A., Baier-Bitterlich G. et al. Soluble receptors for tumor necrosis factor and neopte­rin as parameters of cell-mediated immune activation. Hematology. 1996; 1 (2): 141–154. doi: 10.1080/10245332. Yilmaz R., Altun B., Ozer N. et al. Impact of cytokine genotype on cardiovascular surrogate markers in hemodialysis patients. Ren. Fail. 2010; 32 (7): 806–816. doi: 10.3109/0886022X.2010.494798. Sammour I., Somashekar S., Huang J. et al. The ­EFFECT OF Gender on mesenchymal stem cell (MSC) efficacy in neonatal hyperoxia-induced lung injury. PLoS One. 2016; 11 (10): e0164269. doi: 10.1371/journal.pone.0164269. 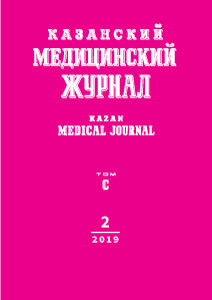 © 2019 Zalova T.B., Polupanov A.G., Tsoy L.G., Rysmatova F.T., Sabirov I.S.